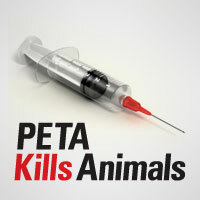 Yet the number you [PETA] put down, in one small area of the United States, is one third of the number that animal organisations put down in the entire UK last year. When things have calmed down a bit [Newkirk] admits that even within the organization not everyone agrees with her [about pet killing]. Apparently all the killing of “adorable” and “perfect” animals —these characterizations by PETA employees are from evidence in a North Carolina trial — has dissidents within PETA wondering if PETA’s definition of “total animal liberation” really means liberation from life itself. Obviously it’s hypocritical for the world’s most notorious animal liberation group — we must quibble with the article’s claim that PETA is “largest,” since other animal liberation groups with starkly similar ideologies like the Humane Society of the United States are larger — to kill the overwhelming majority of the dogs and cats in its care. PETA objected to a pilot program to help homeless pets and homeless people rehabilitate each other in San Francisco.